Split peas have been a food staple for thousands of years. Back in 500 BC, it was a common street food in Athens, where vendors would hawk bowls of hot pea soup. Today, the humble split pea is ubiquitous across the world, and a key ingredient in many hearty dishes. 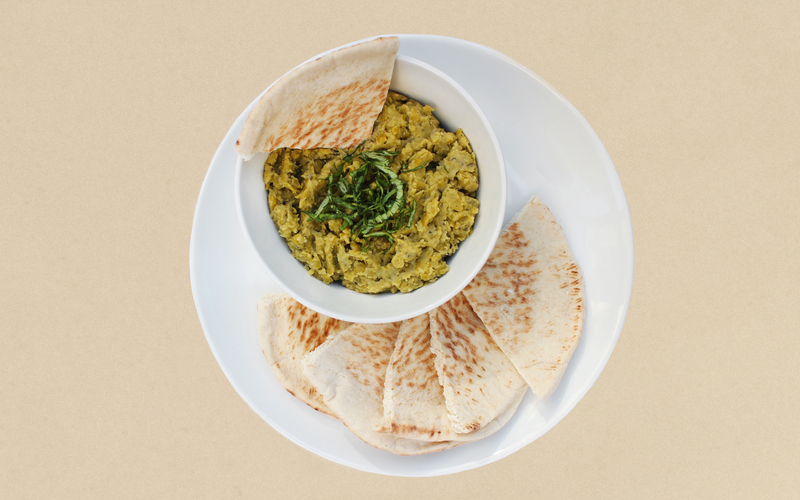 Our split pea dip recipe is both filling and nutritious. Split peas are packed with fiber, and also contain protein, copper phosphorus, B vitamins, potassium and more. Best of all, the flavor is mild, so it’s a great transition food. We encourage you to try letting your little one choose whatever they want to dunk in the split pea dip — heated Pita bread, soft-cooked carrots, and apples are all great options. Giving your little one the freedom to choose what they are going to use to dip is a great way to encourage independence, and allows them to explore the world of food. Split Peas. Onion. Lemon. Herbs. The perfect dip for your little foodie. In a medium saucepan, combine olive oil and onion. Sauté for approximately 3 minutes, until onions are soft. Add minced garlic and dried basil (or fresh), and cook for 1 more minute. Add 2 ¼ cups of water and bring to a boil. Add split peas and reduce to a simmer. Cook the split peas for approximately 40-50 minutes. Remove from heat and allow to cool. In a mixing bowl, combine cooled, cooked split peas, lemon zest, lemon juice, olive oil and salt. Mix until well combined. We ALL loved it!!!! Will definitely make again!! Thanks for the great recipe.